Perfect business plans is a key to success. 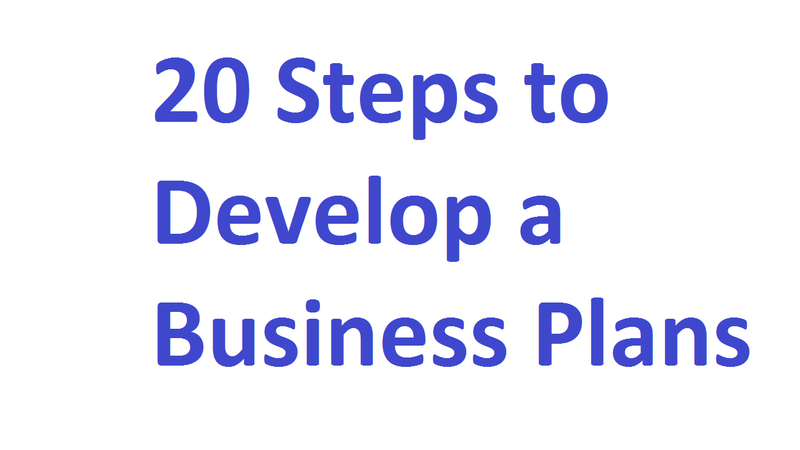 Here are 20 Steps to Develop a Business Plans. These steps will help you to develop business plans that work. An essential step in getting a new venture off the ground is the preparation of the business plans. The process forces the entrepreneurs to anticipate the potential market. In addition, the potential of satisfying that market while the potential pitfalls of organizing a new venture and early signals of the progress of failure. The business plan itself is the basis on which the entrepreneurs runs the business, and in which investors and creditors make their decision to help the entrepreneurs. Here are 20 superb steps in preparing a business plan. Analyze your strength and weaknesses. Choose the product or service that best fits your strength and desire. Because it is very important to develop a good business plan. Determining what profits you want from this business, recognizing the time you will give and the investment you will have. Then complete a projected income statement based upon your decision. Another important step to develop a business plan is analyze your estimated expenses in terms of their fixed or variable nature. Review all aspects of our merchandising plan. You have to determine the firm’s break-even point. If you considering sales on credit review the advantages and administrative decisions involved. Then established a credit policy. You must have to develop a production plan. Survey and test the market you plan to serve to assertion if the necessary sales volume required to produce the profit called for in step 1 obtainable. Prepare a statement of assets to be used. You need to prepare an opening day balance sheet. Determine the sources of assets needed. Study the location and the particular site chosen for specific characteristics. Choose your legal form of organization. In addition, you have to develop an organization plan. Review the risk to which you are subject and how you plan to cope with them. Establish a human resources policy at the beginning. Establish an adequate system of accounting records. In almost, every stage of the development of a business plan while the entrepreneur must gather facts, opinions, and judgments from many sources. Therefore, market research is perhaps the critical steps in the preparation of a business plan.